There was a time when I lingered between life and death. Fully aware of both sides. Fully aware of my in-betweenness. One side holds all the complex and painful emotions of humanity. On the other exists only love, pure and simple. It’s virtually indescribable and unforgettable. Yes, I am talking about a near death experience (NDE). Don’t freak out; it’s a common question I get. Frequently after I deliver a keynote speech, someone will ask if I “saw the light” or had an “out of body experience.” No. Well sort of. It’s difficult and frankly uncomfortable to describe. And not to be rude, but the phenomenological details aren’t important anyway. One thing is undeniably certain to me, we don’t need to suffer near as much as we do. Yet here I am in all my messy, complex, gloriously faulty humanness — just like everyone else. I suffer all of the same destructive ego-driven emotions and defenses that cause harm to self and others. Except I should know better. Shouldn’t I? I feel like I should. Wait…. Do you hear that? Do you hear all of the “shoulds”? There it is, my humanity showing. Our most important task in this short life, is recognizing what love ISN’T so we can do more of what love IS. 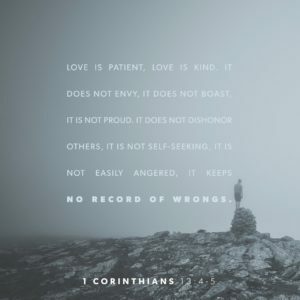 Love is patient and kind, not blaming and shaming. If you hear “should,” odds are pretty strong that isn’t love. We learn discernment by listening to our self-talk because internal mental chatter normalizes beliefs, beneficial or not, which leak out in all directions. In other words, stop being such a jerk to yourself. You strengthen compassion, empathy, forgiveness, and all of the other good love stuff by starting at home in your own head. Don’t worry, love for self is not the same as selfishness and narcissism. Those generate harm to others. Genuine self-love generates genuine self-confidence; which increases your capacity to show love for others. It is an ever-widening circle of strength. So HOW do you do it? It’s easy to say, love yourself and others, but that is so oversimplified it is nearly meaningless, even downright trite. Love is definitely the opposite of meaningless, so let’s take concrete steps to get there. #1 — Listen to yourself. Recognizing your thought patterns and the circumstances that trigger them is critical. Journaling, although not essential, vastly helps declutter the chatter and find clarity. As management guru Peter Drucker famously highlighted, “You can’t manage what you can’t measure.” He was talking about data, but the same holds true here. You can’t manage thoughts that you don’t recognize are running in the background. Mindfulness meditation is a surefire evidence-based method for increasing awareness, focus, and loving kindness. #3 — Talk back. Have you ever noticed that all of the internal negativity seems to have free reign of your mental space? Stop that! But do it with honesty, humor, and grace. Perhaps try a mantra or slogan that’s easy to remember when times are really tough. For example, sometimes my thoughts spin out at night while tinnitus rings in my ears (yeah, that’s a thing). Do you know the feeling of having your brain roar through all of the ‘to do’ items piled up on your list and shaming you brutally for not doing enough or being enough or something else involving ‘not enough’? I do. When I’ve had enough of that chatter, I will say to my mean girl self, “I’m a freakin’ miracle, so there!” Feel free to co-opt it. Just because you may not have had a near death experience, doesn’t you aren’t a miracle too. In any case, respond the way you would to defend someone who is hurting. Because you are. We are all hurting. Everyone struggles with the same unloving temptations and tendencies, so cut people some slack. Let go of blame and shame and shoulds. Once you give patience and kindness toward yourself, it becomes much easier to extend grace to others. We are all fragile beings living a very fragile existence. In the end, all that will really matter is love. So maybe, let’s make that a priority now. You don’t mind that we’ve relocated your legs, do you?